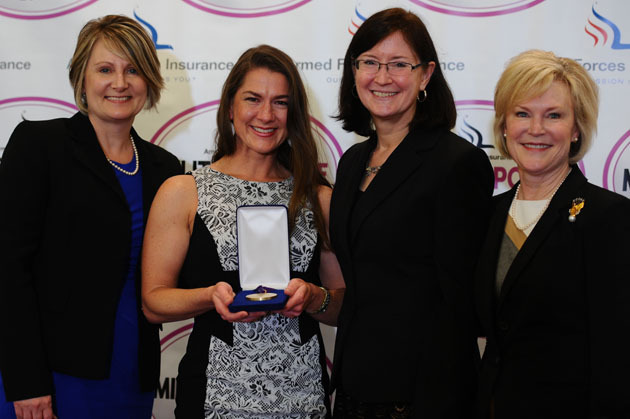 FORT MYER, Va. (AFNS) — Michelle Aikman was named Military Spouse Magazine’s 2016 Air Force Military Spouse of the Year during a luncheon May 5 at Fort Myer. Surrounded by her family and previous Air Force military spouses of the year winners, Aikman was recognized for her lifetime of accomplishments. 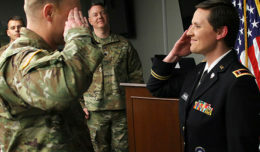 Aikman, who graduated from the Colorado School of Mines with a degree in chemical engineering, has dedicated much of her professional life to pushing military spouse career issues forward but didn’t know what to expect when she was first nominated for the award. Military Spouse Magazine created the award in 2008 to honor military spouses of all ranks and from all branches of service. More than a 1.1 million military spouses support and maintain the homefront while service members defend the nation and its freedoms. The military spouse of the year award recognizes military spouse’s important contributions and unwavering commitment to the military community and country. Aikman founded the SkillAssets, a career management organization that specializes in proactive solutions for major career changers and professionals with significant employment challenges such as gaps in paid employment or a string of seemingly unrelated work experiences. As a recipient of the award, Aikman will continue her work to enhance communication and strength and connections among military spouses at local-base level to pursue solutions that will improve the lives of military spouses and family.